In honour of pancake day, Mimi has created these beautiful chickpea pancakes! 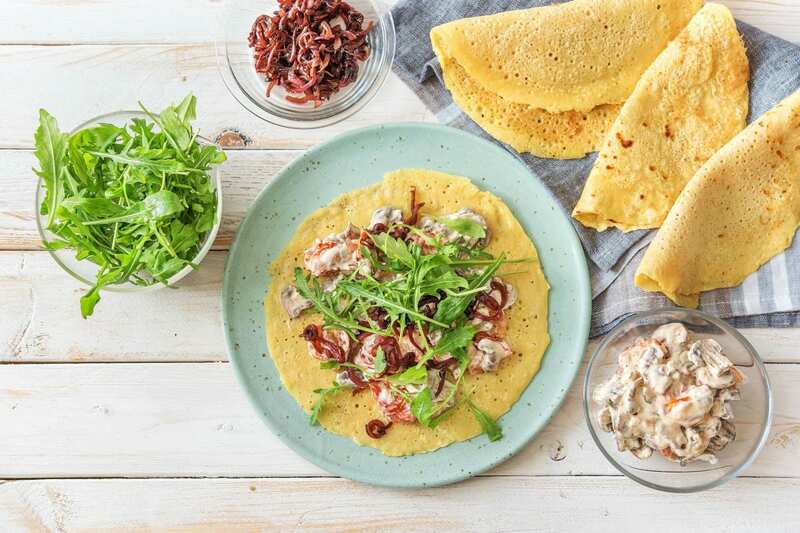 They are egg and gluten free and make beautiful, light savoury crepes. 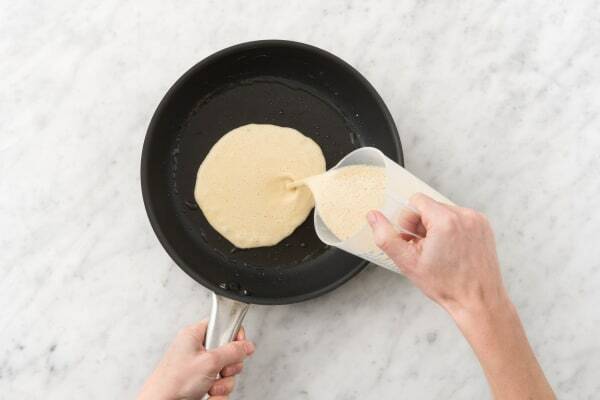 A little chef's trick you learn in this recipe is to rest your pancake batter for a few minutes before cooking, this helps create a more even texture for lighter, fluffier pancakes! Preheat your oven to 200 degrees. Cut the red onion in half through the root, peel and slice into thin half moon shapes. Cut each chestnut mushroom into four slices. Cut the plum tomatoes in half. 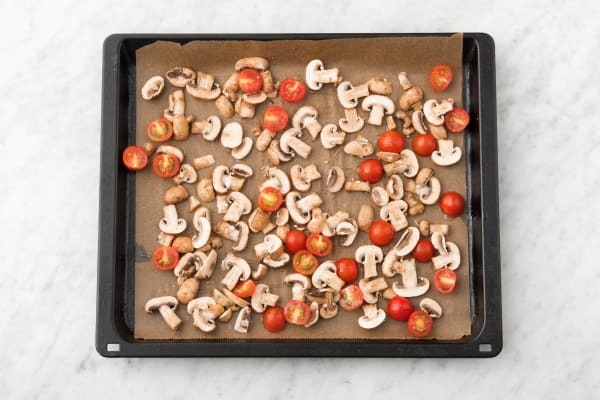 Pop your mushrooms and plum tomatoes on a large lined baking tray. Drizzle over some oil, a pinch of salt and a good grind of black pepper. Give the tray a shake and leave to the side for a few minutes. To make the batter, put the gram flour in a large bowl with a good pinch of salt and a grind of black pepper. 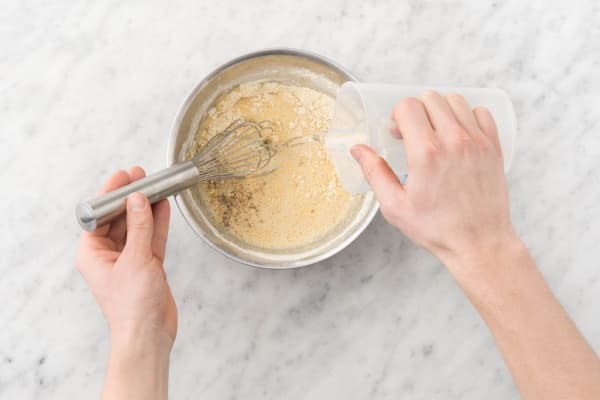 Whisk in the water (amount specified in the ingredient list) with a whisk or a fork, until you are left with a smooth batter (no lumps!). Pour your batter into a measuring jug. Leave to the side to stand for a few minutes (this is essential for pancake making). Drizzle a good glug of olive oil into a saucepan on medium heat and add your onion. Cook for 7 mins. Meanwhile, pop your mushrooms and tomatoes on the top shelf of your oven for 15 mins. When your onion has cooked for 7 mins, add the balsamic vinegar, pop a lid on, turn the heat down to low and leave to cook for 8-10 mins until nicely caramelised, then remove the pan from the heat and leave to the side. Meanwhile, cut the goat's cheese into roughly 1cm chunks and leave to the side. Pancake time! For the perfect pancake you need a hot pan. 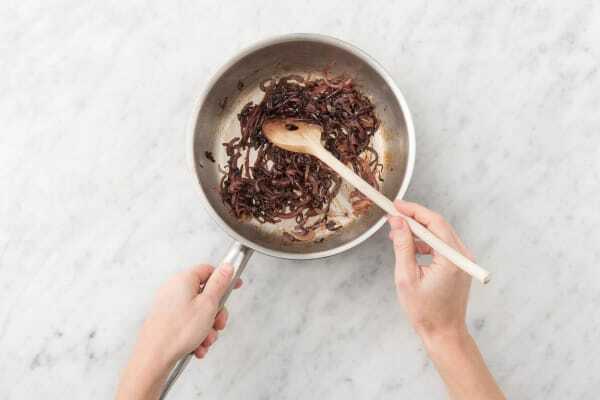 Drizzle some oil into a medium-sized frying pan (about 20cm wide), and put on high heat. Use kitchen paper to rub the excess oil away (careful not to burn yourself). Once the pan is hot, pour in 75ml of batter (you will be making two pancakes per person, but we've given you a bit of extra batter to practise with!). Quickly tilt your pan to roll your batter around, until it covers the base of the frying pan (see picture 6). Leave to cook for 2-3 mins, until you can see bubbles appearing and your pancake comes away easily from the pan. Carefully flip and cook the other side for 1-2 mins. Both sides should be golden - don't worry if your first pancake isn't the prettiest, it's not a beauty pageant! Tip:If you only have a small frying pan, just use 50ml of batter per pancake and make more pancakes! Once your veggies are roasted, remove them from your oven, drain off any excess water and add to a bowl with your goat's cheese. Stir together to melt your cheese. Plating up time! Take everything to the table - this is a fun one to serve yourselves! We recommend adding a spoonful of your cheesy veggies to a pancake, followed by a little caramelised red onion and a handful of rocket, then devouring your open pancakes.